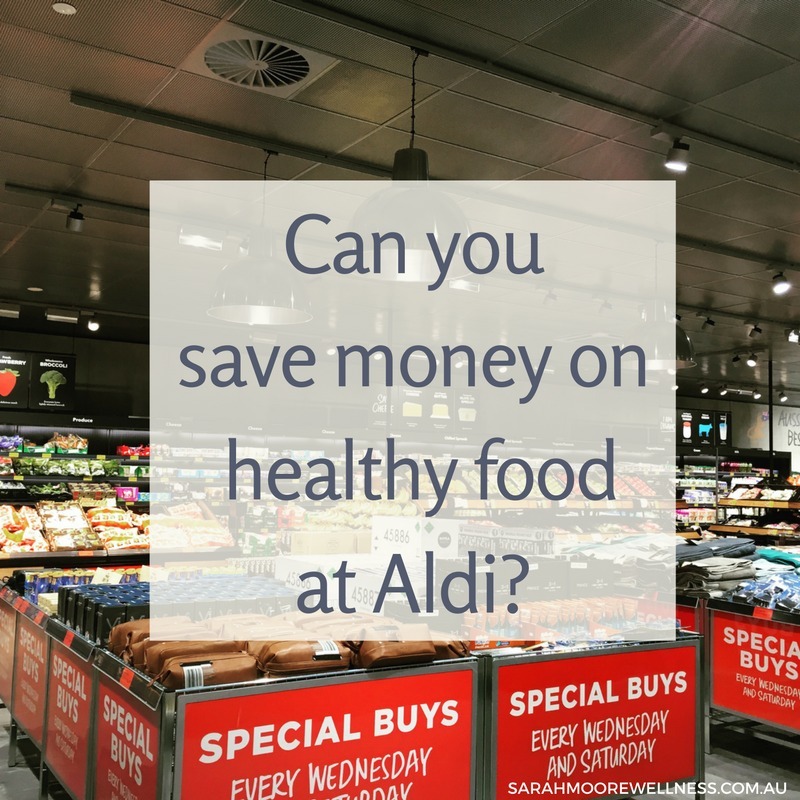 Can you save money on healthy food at Aldi? Last week we covered the basics of shopping at Aldi in my post 10 things you need to know before you shop at Aldi. For some minor annoyances, you should expect to save money on healthy food at Aldi. You will also get out of there a lot quicker than if you were shopping at one of the major supermarkets. 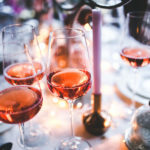 If you haven’t seen my first post in this series, 10 Tips for Shopping at Aldi read that first. 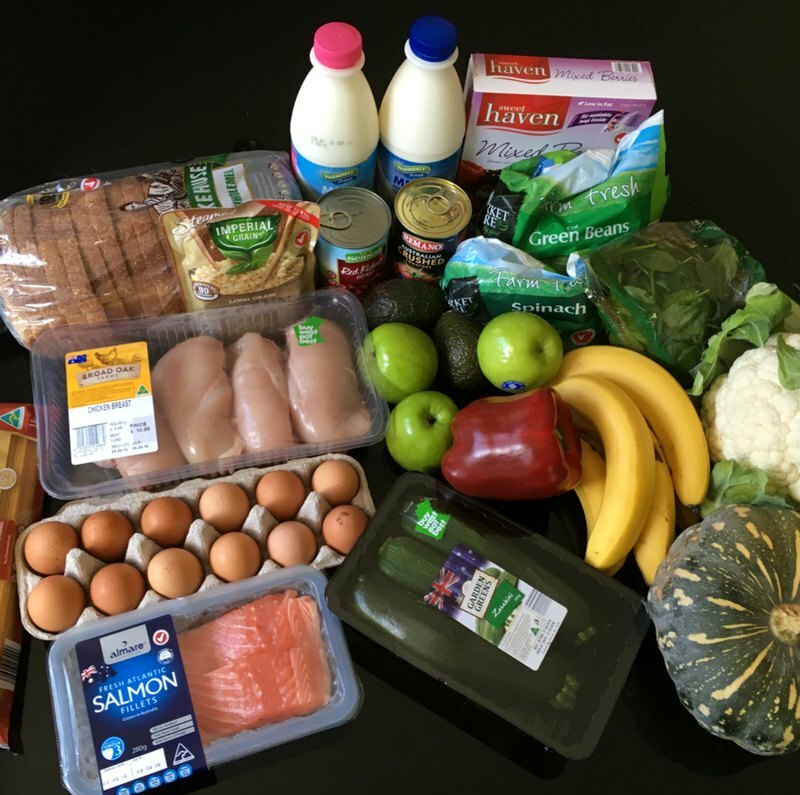 This week I’m comparing Aldi and Coles. We already know Woolworths is more expensive. It seems clear that you can save a lot on packaged and processed foods by shopping at Aldi. I wanted to know if I could save money on fresh healthy food at Aldi. This wasn’t designed to be the cheapest shop – it is a real list of things we needed (wanted). I was a good 10 minutes quicker shopping in Aldi than in Coles. This surprised me as I knew the layout better in Coles. Aldi’s layout with fewer aisles does lend itself to a more efficient shop. It’s easy to grab what you need without walking the length of the supermarket 8 times. I think this will help if you’re an aisle wanderer, prone to filling the trolley with things you don’t need. As I have mentioned before, the checkout process at Aldi is a lot quicker, even though you pack your own bags. With a grumbling baby in the pram I appreciated the speed. 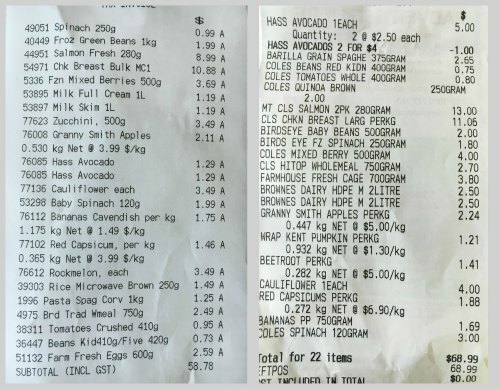 How do Aldi and Coles compare? There were a few things missing from Aldi, possibly because I went at the end of the day. They didn’t have any fresh beetroot and there were no 2L milk cartons. only 1L left. An example of their streamlining, a lot of produce at Aldi’s is packaged and you won’t find any vegetables pre cut. So the zucchinis on my list came in a pack of 3 and I had to get a whole pumpkin. Aldi didn’t have any interesting mixes of other grains in their quick rice section like Coles do. This really isn’t a big deal as they do quick brown rice and regular bags of wild rice and quinoa if you like variety (techinically quinoa is a seed). They also didn’t have wholemeal pasta. They did have wholemeal pasta in the gluten free range which is great for anyone with sensitivities. Interestingly, the country of origin was the same for each item from both Coles and Aldi. The pasta and kidney beans were Italian and the frozen berries were from Chile. The rest were Australian. I was happy with the quality of the produce at Aldi and it lasted just as long as the produce from Coles. The chicken breasts and salmon look exactly the same from both shops. Without the packaging you wouldn’t have been able to tell the difference. One of the main criticisms of Aldi is the lack of variety. I wonder if this will actually help you shop better. It means you are in and out a lot quicker with less brands to choose from. They have less item lines which means some of your favourite packaged foods might not be stocked. Things like your favourite marinade, taco kit or muesli bar. So you may end up back to one of the other supermarkets to finish you shop – or you could make do without them. These are unlikely to be healthy staple foods anyway. If you’re willing to make a few changes you could easily get everything you need to feed the family from Aldi. You might even end up with a healthier trolley if you go with a plan. The one healthy staple that I did notice that Aldi didn’t have, was dried beans. I normally buy canned chickpeas and kidney beans – because I’m lazy. While the canned beans at Aldi were cheaper than Coles, it is cheaper to get the dried beans, chickpeas or lentils from Coles or a bulk food place. The only thing at Aldi that was more expensive than at Coles was canned tomatoes. I could have bought a cheaper, Italian variety for $0.73 at Aldi, but I chose the Australian version $0.15 more expensive than Coles. Everything else on my list was cheaper at Aldi even with large sized packaging. Those with a keen eye for detail will see a mistake on each of these receipts. At Aldi, I was charged for a $3.49 rockmelon which wasn’t on the list. This should have been the pumpkin at $1.49kg – this might have worked out about right. At Coles, I wasn’t charged for the zucchini. This should have been $2.40. Straight up, I was $10.20 better off at Aldi. For the savings though, I was down 2L of milk and a beetroot. If we adjust to make the lists comparable add the difference for two 2L milks from Aldi (+ $1.62). 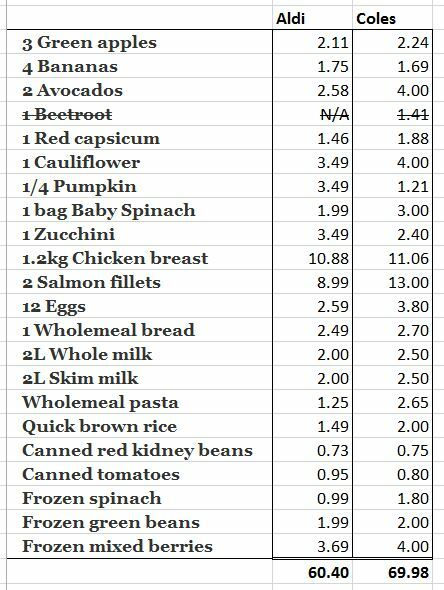 Then add a zucchini (+$2.40) to Coles but remove the beetroot (-$1.41). Then we are are at $69.98 for Coles and $60.40 for Aldi. A total difference of $9.60 in favour of Aldi. But remember I am still up 3/4 of a pumpkin, 2 zucchinis, 500g of frozen green beans and 625g of pasta (even if it’s not wholemeal). So I think Aldi is well worth a visit, especially if you are feeding a family. It would be easy to spend even less than this. Keep an eye on the meat and fruit and veg specials and planning your meals around them before you go. It would be interesting to see how Aldi stacks up for those who buy free range or organic produce. I imagine the options might be limited. I have also learnt to check my reciepts! I never look at them again once I get home. Having a mistake on each of these has made me wonder how much money I’ve saved/lost from cashier error. You might also noticed that I didn’t pay any tax (GST) on any of my groceries. That’s because only foods that aren’t considered staple foods attract GST. Another reason to limit processed. Stay tuned for my final post in the Aldi series next week. I’ll see how nutritious Aldi’s cereals, frozen meals, snacks and other packaged foods are compared to the leading brands. 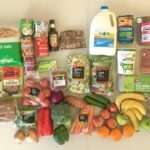 Can we make Aldi a one stop shop for quality healthy food? Do you get overwhelmed reading food labels at the supermarket? Do you wish it was easier to bring home healthy food the family will love? Ask me about my VIP guided shop. I will come with you to do the food shop. I’ll teach you how to choose the healthiest options that the family will actually eat. 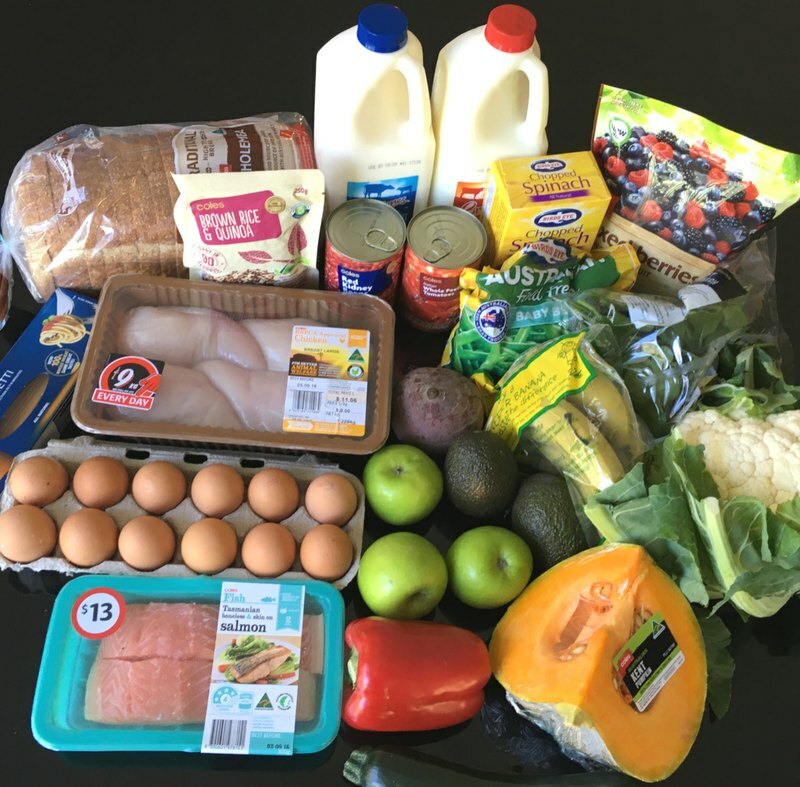 Have you saved money on fresh groceries at Aldi? Have you been happy with the quality of the produce?